Photo credit: Scripps Research Institute. 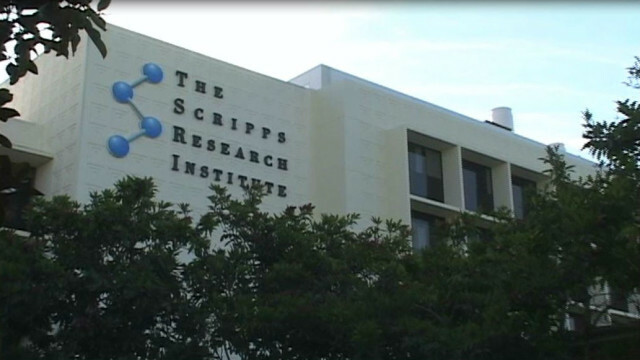 The Scripps Research Institute Monday announced the discovery of a molecule that helps retard the growth of certain types of cancer. A TSRI study, published in the Proceedings of the National Academy of Sciences, found that a molecule called CBR-5884 inhibits the production of the amino acid serine by 30 percent. Serine is a protein building block necessary for nucleotide, protein and lipid creation in all cells, and is part of the growth process of breast cancer, lung cancer and melanoma, according to the TSRI researchers. They said CBR-5884 inhibits a specific enzyme known as 3-phosphoglycerate dehydrogenase, which is responsible for the first step in serine biosynthesis. “In addition to discovering an inhibitor that targets cancer metabolism, we also now have a tool to help answer interesting questions about serine metabolism,” said Luke Lairson, an assistant professor of chemistry at TSRI. The study also determined that the molecule didn’t help with other types of cancer. Lairson was assisted by scientists from the California Institute for Biomedical Research, Harvard University, the University of Michigan, Weill Cornell Medical College of New York, Beth Israel Deaconess Medical Center of Boston and Katholieke Universiteit and Vlaams Instituut voor Biotechnologie, both of Belgium. The research was funded by the National Institutes of Health, the Pancreatic Cancer Action Network in Manhattan Beach, the New York-based Damon Runyon Cancer Research Foundation and Los Angeles-based Concern Foundation.